Home > Aviation > Hawaiian Airlines, Inc. 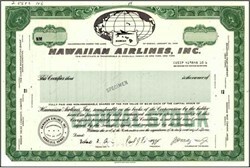 Beautifully engraved SPECIMEN certificate from the Hawaiian Airlines, Inc. This historic document was printed by the American Banknote Company and has an ornate border around it with a vignette of the company logo. This item has the printed signatures of the Company’s Chairman of the Board, President and Treasurer. The certificate's border has been cut in the lower left hand corner.